LiveGrow™ is a patent-pending breakthrough platform that delivers the first ever effective and cost-effective biological solution to the crop and turf protection industry by redefining the entire process of fermentation, manufacturing, and application of biopesticides and biostimulants. Our fermentation process mimics soil environment to grow any fungal or microbial strain into an effective, consistent, and cheap microbial product. Our cost effective manufacturing process is flexible to demand, 100% waste free, and produces metabolically active products with impressive shelf life. Our field application process delivers live microbes to the field and protects them from predation to ensure ultimate efficacy on par with chemicals. Four years ago AGPW Group began the development of a new technology to manufacture, store, distribute and apply highly concentrated live microbial products for agriculture and T&O. This technology, which we call LiveGrow™ is designed to manufacture products based on live metabolically active microbes and maintain them live and active at high concentration throughout the entire process of manufacturing, storage, and application in order to insure that they are ready to start acting in plant/seed environment immediately after application. Our technology also allows us to use any free-living bacteria or fungi to make a product, significantly expanding the pool of potential organisms for novel and effective microbial products, including the highly sought after Gram-negative strains. The overall production process can be described as filling an open cell matrix with inoculated medium and incubating it at room temperature. The fermentation happens in discrete highly isolated units placed on light recyclable pallets in a warehouse. These units are the final product and no further formulation is required. This approach results in high concentration of microbes which can be regulated by media composition. The units’ content is isolated from the environment while allowing necessary gas exchange for microbial growth. This design has many advantages comparing to traditional liquid-state and solid-state fermentation. One advantage is the ability to produce products using non-spore forming Gram-positive and Gram-negative bacteria without danger of contamination with undesirable microbes. Second, our products do not need stabilization such as drying and subsequent formulation. As a result, LiveGrow™ process eliminates any downstream processing and generates almost zero waste streams, does not need expensive bioreactors and accessory equipment, and significantly reduces the number and cost of highly qualified staff. Third, LiveGrow™ manufacturing process is also very flexible and easily allows switching from one product to another. All these advantages lead to a low cost of set-up and manufacturing with low cost of goods per acre. LiveGrow™ process combines fermentation and storage stages significantly simplifying manufacturing and reducing costs. Products are stored under normal conditions on light weight pallets and have a shelf life term of at least 6 months. Cooler temperatures can significantly prolong shelf life if needed. LiveGrow™ products can be delivered to customers by trucks with or without climate control depending on weather and climate. Since they are stored on pallets, loading/unloading is seamless. Another advantage of our technology is it allows accomplishing fermentation while products are in transit to a customer, increasing the overall productivity and simplifying fulfillment of “last minute” orders. Currently, LiveGrow™ products are designed for seed and soil application. They can be applied using standard agricultural equipment through broadcasting, broadcasting with water, mixed and added with seeds etc. This is possible due to wide variety of particle sizes we are able to utilize as part of LiveGrow™ technology. 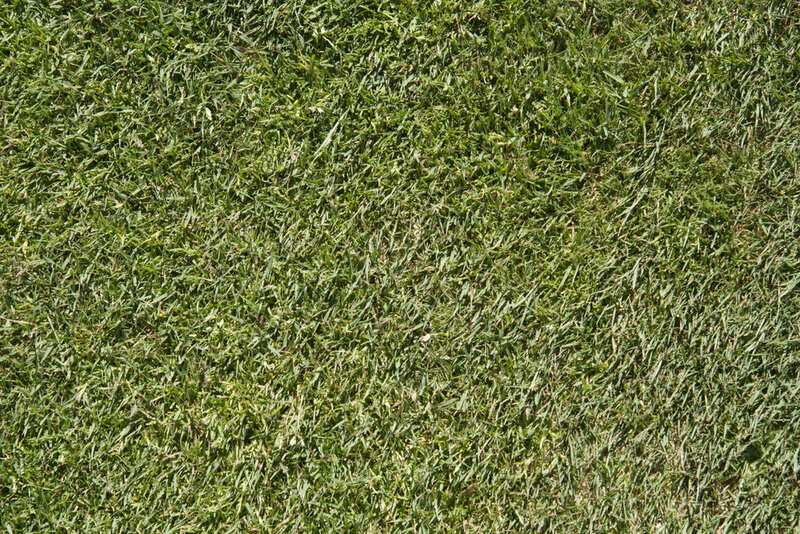 For example, we used 0.2-0.3 mm particles for golf turf application. Products were mixed with appropriate amount of water and broadcasted using golf course standard equipment for chemical application. In case of wheat, we applied 1.5-2.0 mm particles through field standard seeder. To do this, product was mixed with wheat seeds and applied together. Our products also can be mixed with soil or soil-like media for greenhouse application. Application of LiveGrow™ active microorganisms contained in open-cell matrix has several advantages missing from standard dormant microbial products. First, they are metabolically active and can start action and rhizosphere takeover almost instantly, whereas dormant microbes from existing microbial products have to “wake up” and adjust their metabolism to survive in the new environment. Generally, they cannot do it efficiently and this is one reason for the reported inconsistencies of trials. LiveGrow™ microbes have a much better chance to adjust their metabolism and cell makeup appropriate for a new environment because they are metabolically active. Second, containment of microorganisms in open-cell matrix prevents predation by nematodes and other eukaryotic predators feeding on bacteria in soil. This retains a high population of effective organisms for longer period of time, therefore improving efficacy. Third, LiveGrow™ particles serve as longer-term inoculation vehicles that allow more organisms to colonize the intended target for extended periods of time. On the contrary, existing commercial microbial products, which are free microbes added to soil, usually decline in numbers pretty quickly according to multiple published research. The project began in the Fall of 2016 and focused on testing AGPW's LiveGrow™platform grown and applied fungus, Trichoderma sp., against pink snow mold on a tee of a golf course in north central Washington State using the course’s standard spray equipment. This course has snow on it for three to four months every year and has always suffered pink snow mold damage that caused significant turf losses every year, especially in the tees and greens. 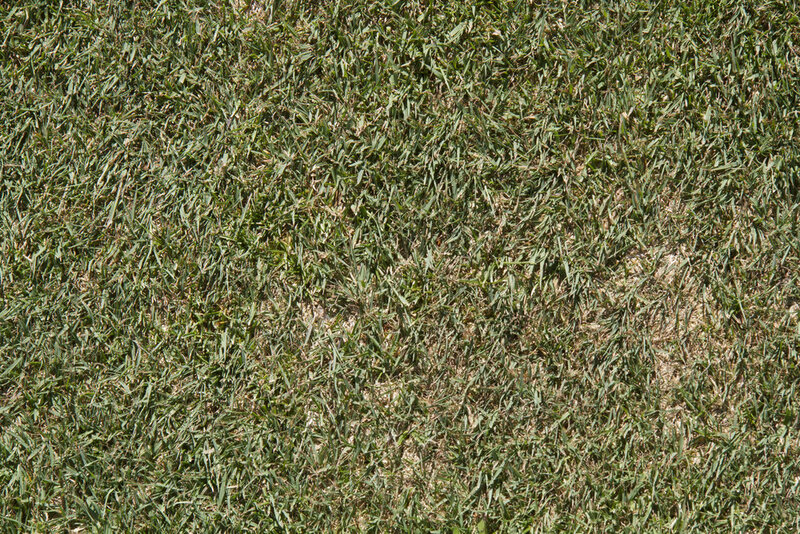 Application of the LiveGrow™ fungus dramatically reduced the incidence of Pink Snow Mold this spring. "There was only a very small area of pink mycelia on the treated turf, but the untreated areas were covered in pink mycelia," said the course superintendent when the snow melted at the end of March. Later, after the grass started growing, the course superintendent stated that ‘The grass in the treated area grew back faster, was denser, and gave a better playing surface sooner’. These differences were still visible two months later in mid-June. - If viewing images below on mobile, please rotate your device into landscape mode to read the description of each photo. Example of Gram negative bacteria performance when grown and applied through LiveGrow™ platform. 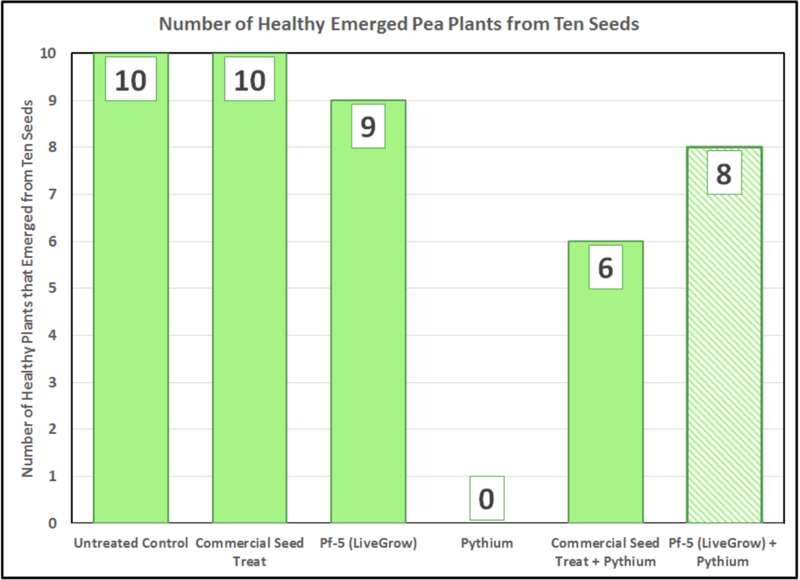 Gram negative bacteria, Pseudomonas fluorescens strain Pf-5, grown with LiveGrow™ were effective against Pythium ultimum and protected peas as well as the best chemical treatment available. Example of Gram positive bacteria performance when grown and applied through LiveGrow™ platform. Gram positive bacteria, Streptomyces lydicus strain, consistently protected peas better than the leading chemical treatment when gown and applied through LiveGrow platform. Additional important results achieved through LiveGrow™ technology. We achieved live cells or spore concentrations between 1E+9 – 1E+11 CFU/g which are significantly greater than claimed by leading biological products. Microorganisms were grown with LiveGrow™ technology on different sizes and types of biodegradable man-made particles which will allow for different types of applications. We created and successfully lab-tested an industrial prototype of the “universal unit” that will be used to manufacture products through LiveGrow™ technology. Tests of LiveGrow™ formulations stored under room temperature showed a shelf life at least 6 months without significant loss of viability. Longer shelf life tests are in progress and longer terms are expected. To view the greenhouse study poster in its entirety, please download it below. Below you can see charts that display how LiveGrow™ compares to biologicals and chemicals produced today in terms of efficacy and consistency vs toxicity and cost of manufacturing.